The most important thing to remember when you suffer a dental emergency like a cracked or broken tooth is DON’T PANIC. Your emergency dentist in Ocala will do everything in our power to see you on the same day as your dental accident. The sooner we’re able to treat your cracked tooth, the quicker you’ll be looking and feeling back to yourself again, if not better! Dental Emergency? Remember two things: keep calm and contact Weldon General & Cosmetic Dentistry. Dr. Daniel Weldon knows there are various types of cracked teeth and different ways to treat them. It’s important for you to be able to recognize these differences as well. Tiny cracks on the outside of your teeth that only affect the outer layer of your tooth (enamel). When the crack extends from the chewing surface down toward the root. It will definitely get worse if not treated and can result in tooth loss. If a tooth has become split, it’s usually because it was originally cracked and didn’t receive the appropriate dental care. After being neglected, you can identify two spate segments. When a crack begins in the root of the tooth and extends to the chewing surface. These types of cracked teeth hardly show symptoms until the surrounding jawbone and soft tissue become infected. Here are some of the dental procedures we offer at Weldon General & Cosmetic Dentistry. Your dentist in Ocala will determine which of the following treatments are best for you and your lifestyle. If your tooth is cracked and you’re now experiencing pain when you chew, drink, speak, or eat, Dr. Weldon may recommend a dental crown. A dental crown caps the affected tooth with tooth-colored porcelain. This will give your smile newfound stability and an improved appearance. If the crack in your tooth has extended to the root of your tooth, you can get a root canal to treat it. A root canal will remove any dental debris and bacteria from inside the tooth and seal it with a sturdy dental crown. If the crack in your tooth exceeds even lower than your gum line, your tooth is unfortunately no longer treatable. Since your natural tooth has already exceeded the point of saving it, you will need to consider tooth replacement options. Dental implants are the best way to replace your natural teeth because they mimic your tooth from root to crown with three biocompatible pieces: titanium implant posts, abutments, and the dental prosthetic of your choice. Contact Weldon General & Cosmetic Dentistry ASAP! 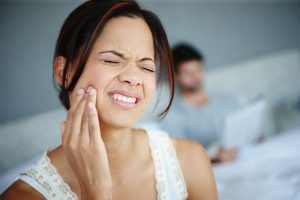 Again, the most important part of managing a dental emergency is to remain calm until you can visit your Ocala dentist. If you are faced with a cracked tooth, it can be scary! But do not delay calling our office! Our dental professionals will do everything in our power to relieve your pain and restore your smile with long-lasting results.